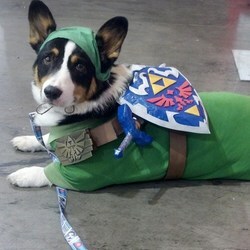 Corgi Cosplay is made up of Kiba (a Pembroke Welsh Corgi) and his human sidekick Nicole that live in Arizona! Kiba is actually Nicole's service dog and takes his job pretty seriously, even under the costumes. Kiba started cosplaying about 5 years ago with a Link cosplay (Legend of Zelda) and a Moogle cosplay (Final Fantasy series), and Nicole slowly started about 4 years ago with Hinata (Naruto). Since their start, they have now guested at over 20 cons and have been featured in articles online and in print. Nicole loves talking about cosplay positivity and it being for everyone, no matter size, color, gender, nor even species!